Unconventional design, unmatched performance, and familiar AR handling. The SIG MPX redefines the submachine gun category with a new level of operator safety, in-field adaptability and proven reliability in the harshest environments. Completely ambidextrous, the SIG MPX is great for left- or right-handed shooters with its dual-sided selector switch, magazine release, charging handle and bolt release. 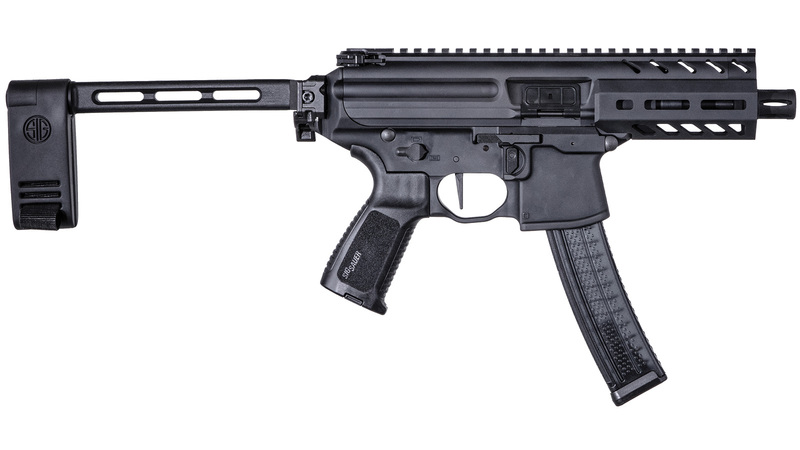 The SIG MPX operates from a fully-closed and locked rotating bolt, offering enhanced reliability and safety in use. A short-stroke gas piston allows the SIG MPX to run all weights and brands of 9mm ammunition with no adjustments to the gas valve. A full-length picatinny rail allows for solid, consistent mounting of optics and targeting lasers. The MPX K PSB features a 4.5" barrel, side folding brace and a short aluminum KeyMod (not MLok as shown) handguard with handstop.